In crop rotation, the fallow period is the period between the harvest of the main crop (sown for the purpose of harvesting) and the sowing of the next (Fig. 1.1). Depending on the harvesting and sowing dates of main crops, it can last from several days in the case of late harvest followed by sowing of a winter crop, to several months (up to 9 months) in the case of a spring crop. During this period, soil that is left “bare” (without plants), especially in the event of a long fallow period, can significantly increase the risk of leaching of nitrate into aquifers. The use of a cover crop as a nitrate-trapping “catch crop” can reduce this phenomenon of nitrate transfer in variable proportions depending on the soil and climate conditions, as well as the cropping system. The reduction lies in the range of 20–90 % compared to bare soil. 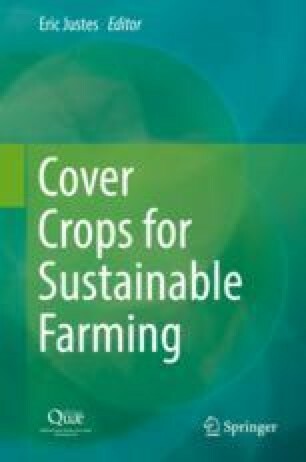 This broad range of efficacy needs to be analysed on the basis of factors determining water drainage and nitrate leaching, as well as the other multiple functions of cover crops.